This light and healthy Coleslaw with Kale, Apples, and Pomegranate is one of my favorite slaw recipes. It’s refreshing and zesty enough to be served as a side salad for any meal, yet at the same time sufficiently filling and satisfying to make your perfect low-carb lunch. Even if you’re not a coleslaw lover, let me tell you a sure thing. This Coleslaw with Kale, Apples & Pomegranate is NOT your average greasy, heavy, mayonnaise dunked slaw. It’s not your mushy, watery, sugary slaw. It’s rather your dream-come-true coleslaw! 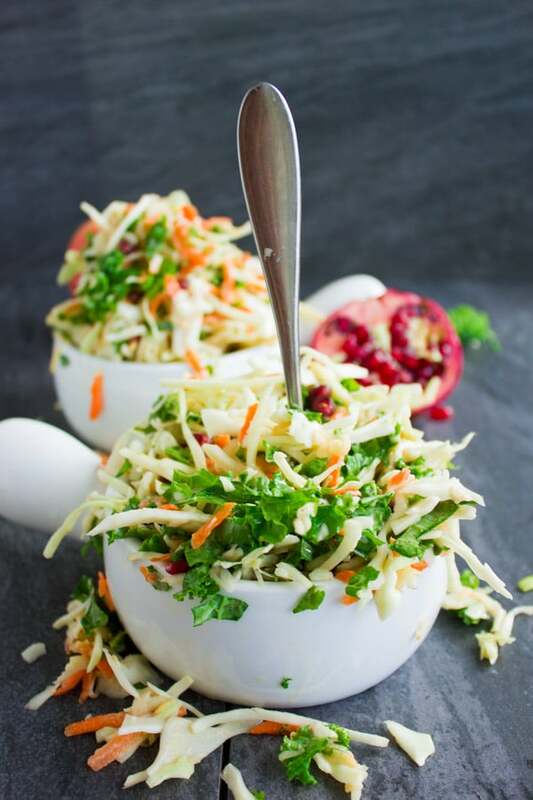 I usually make my healthy light coleslaw salad recipe whenever I crave the classic version of coleslaw. It’s made with sour cream only – no mayo! And it’s ultra creamy, light, slightly sweet and super satisfying. But once in a while I feel like a change and come up with a nice twist like this Coleslaw with Kale, Apple & Pomegranate Seeds! 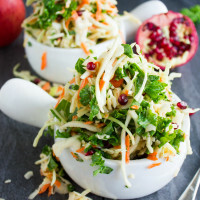 This healthy Coleslaw with Kale, Apples and Pomegranate Seeds is one of my favorite slaws! It’s ever so crunchy, perfectly sweet, slightly bitter and ultra light and healthy. Refreshing and zesty enough to be served as a side for any meal, yet sufficiently filling and satisfying to make your perfect low-cal lunch. My Coleslaw with Kale, Apples & Pomegranate is less creamy than your average coleslaw, and so much crunchier! It’s crunchy cabbage, crunchy sweet apples, and slightly crunchy pomegranate, and perfectly crisp kale. 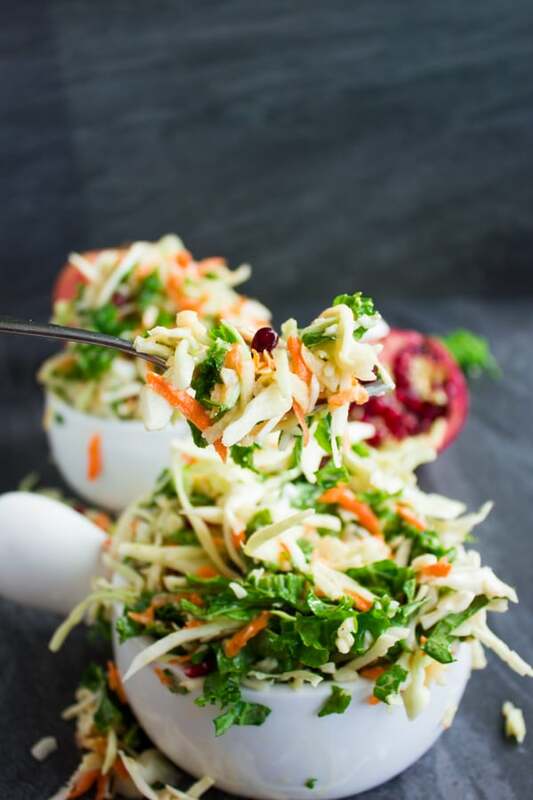 Simply put, it’s a really good healthy salad and a really nice twist on your average slaw! In a large bowl, mix all the ingredients for the salad. Now on to the dressing: The secret to ultra flavorful classic coleslaw dressing is chopping some scallions and pickled cucumbers very finely and adding them into the dressing. If you’re out of scallions, use red onions or any other type but a little bit less. The second secret here, is to use a little bit of the sweet pickle water along with apple juice. The easiest way to get apple juice is by squeezing out as much liquid as possible of your shredded apples before they go in the salad, and use that liquid to sweeten up the dressing! A touch of vinegar (apple cider is best, but any white vinegar works! ), and finally a touch of sour cream. Add all ingredients in a sealable container. Seal the container well and shake it vigorously until the dressing emulsifies. 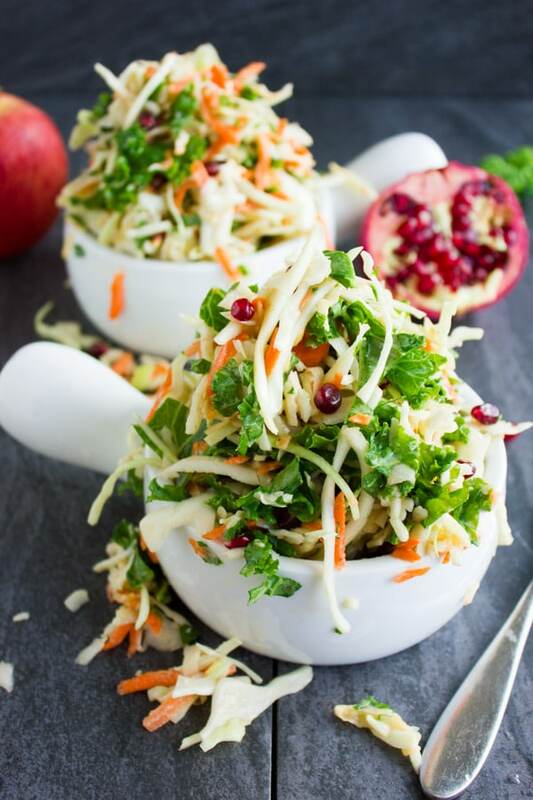 Pour the dressing over the Coleslaw with Kale, Apples and Pomegranate, mix well and serve. 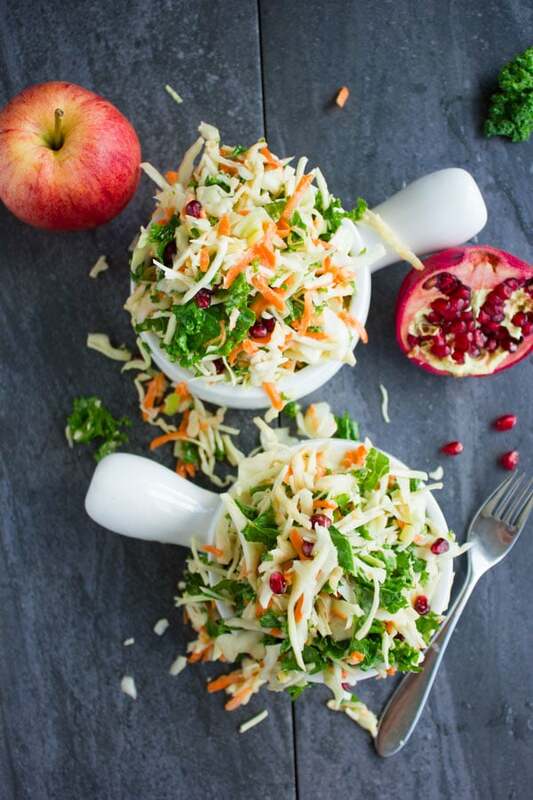 I love making this Coleslaw with Kale, Apple & Pomegranate as soon as spring comes around. It’s absolutely refreshing, zesty, crunchy and sweet! Super delicious on its’ own, or on a side of sandwiches, burgers, tacos, and anything grilled—hello bbq! 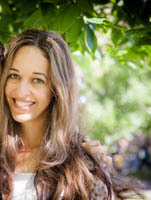 Not to mention picnics, brunches and potlucks! If you are vegan, use vegan sour cream or skip it altogether and use olive oil to emulsify the dressing. Feel free to use spinach in this coleslaw recipe if you’re not a kale person. Serve this easy Slaw with Kale, Apple & Pomegranate as a side for this Quick Zesty Herb Tilapia, along with some herbed quinoa. 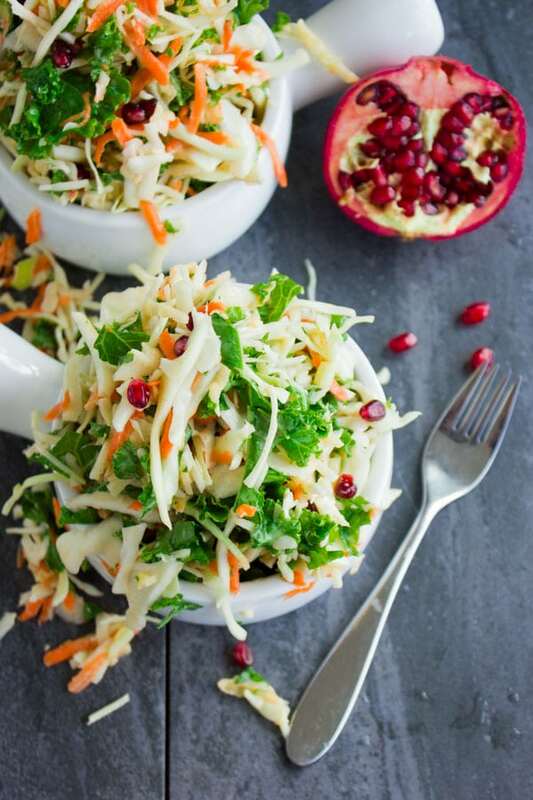 This light and healthy Coleslaw with Kale, Apples and Pomegranate Seeds is one of my favorite slaw recipes. It’s refreshing and zesty enough to be served as a side of any meal, yet at the same time sufficiently filling and satisfying to make your perfect lunch. Add all the ingredients in a sealable container. Seal the container well and shake it vigorously until the dressing emulsifies. Pour the dressing over the salad, mix well and serve. I make all different types of slaw. This is a recipe I need to try. Renee, I think he absolutely will!! My close friend is just the same, but she enjoys this coleslaw 🙂 Thank you!